Adult Dance & Fitness Classes at Evolutions School of Dance are meant to be fun, motivating, and a great to way to maintain or get into shape. Numerous styles and session lengths are available for a variety of interests! It’s never too late to start dancing OR to get back into the studio! * Sessional classes are non-refundable and credits will not be issued for missed classes. If the class does not run, we will provide a full refund. Prices do not include GST. Our Mommy & Me – Pre & Post Natal Dance Fitness class is a time to enjoy a connection with your baby in a relaxed, playful way while increasing your own strength, flexibility and tone. This class will get you moving, allow you to bond with your baby and connect with other new mamas, all in a safe and welcoming environment for you (and your little partner)! This class is suitable for all pregnant (baby bearing) or postnatal (baby wearing) mothers. 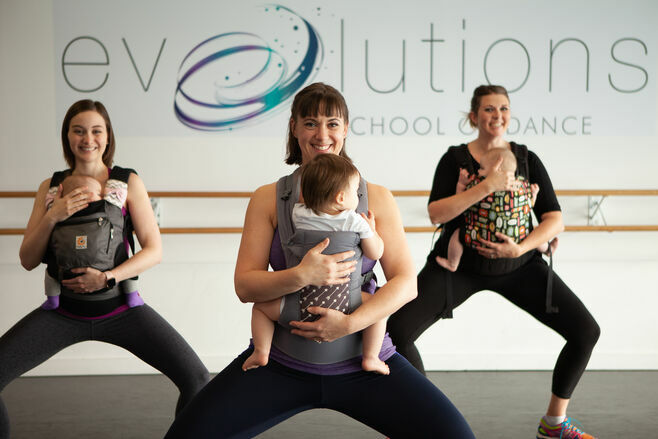 We welcome all levels of fitness and dance experience – both pre and post natal, as long as you have the clear from your medical provider to exercise and are able to wear your baby in a carrier for the duration of the class. With an emphasis on cardiovascular endurance, strength and flexibility, this class progresses at a rate that allows for accommodations and modifications in order to meet the need of each mama. This class is for all expectant mothers, and mothers with babies 6 weeks of age or older! What To Bring: A sturdy carrier (Ergo, Tula or similar), comfortable clothes, a pair of indoor running shoes, water bottle and a yoga mat. *** Do you have an older child (toddler or preschool age) that you need to bring with you? Message us regarding options! Are you a former dancer who is longing to dance again? Walk, pique or jete your way into the studio and let our experienced faculty help you build stamina, endurance and confidence. Classes will progress at a rate that allows you to grow in strength and refine your technique, with movement and combinations becoming more complex over the session. Rediscover your passion for dance in our Adult Lyrical Jazz for the Experienced Dancer.